Home » DECORATING IDEAS » 24 Spring Mantel Decor Ideas To Brighten up The Space with Seasonal Blooms! It’s spring and everything outside seems to be blooming with bright natural hues, great fragrances, and fresh greens. If you are planning on bringing a little of that seasonal prettiness to the house, these spring mantel decor ideas are surely going to brighten up your day. Best Spring Mantel Decor Ideas – Pin it for later! Set against a neutral background, this lush leafy wreath creates a focal point while charming up the mantle. You have also got some low-height candlesticks add so much more glow to the spring evenings. The icing on the cake here is a rustic flower box and a handful of table-top plants. Celebrating the colors of spring while keeping the color scheme a bit natural and earthy is a rare phenomenon. However, this mantle decor inspiration does that quite effortlessly. A wooden tray holds pretty florals, accompanied by beautiful aqua vases with a brighter choice of flowers. A great mantle decor reaches new heights of awesomeness with an equally beautiful backdrop. A large canvas is wrapped with some fabric or wrapping paper, further adding a glittery text garland – ending up in the ceramic bunnies in the foreground look even cuter. A faux nest, little birdhouses and glass vases are splendorous. The title itself suggests that this inspiration is all about working up contrasting elements together. A dark wood frame is coated with duck egg blue, going for a bright white for its interior designs. The wreath placed in the center of the frame sports just about every color of the rainbow you can think of. An Easter tablescape create right above the fireplace as glorious as this one won’t fail to hit all the right notes! 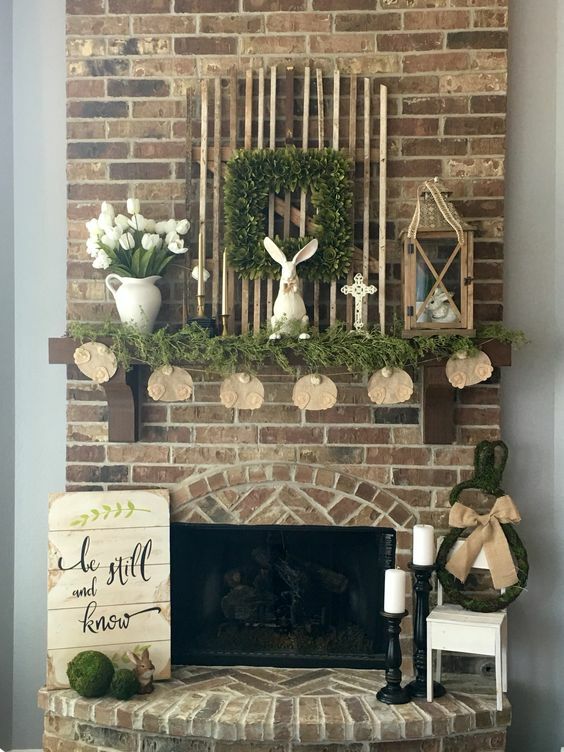 Three faux boxwood wreaths and a picture frame hang from a metal art piece above the mantel, while two bunnies add the perfect Easter spirit to the setting. Attach some mini lights to the wires as well as o blooms inside the vases. An uber cool print saying “you make my heart sign” is the most precious thing about this mantle, rightly accompanied with a luxurious golden frame. For an added touch of refreshment, you will find lots of lemons placed in a tray, along with some fresh flowers in pretty pitcher vases. Forging this magnificent mantle decor would be enough to let the whole room dance with some festive joy! Large glass bottles holding faux spring blooms sit on the mantle, while looking oh so true to life. Some other items that deserve a mention are a large egg cup, lots of tiny nests placed inside picture frames, and a transferware in blue and white. Nothing can beat the marvel that the addition of some bright golden glow brings to luscious green branches. And this spring mantle decor is a perfect example of the same. A large empty frame finds a lovely wreath in the center, while solid black candlesticks hold huge candles with true grace. Glass jars and mini pots finish the look. Is there anything spring-worthy that this mantle decor doesn’t cover? Right from super cute bunnies to so many candles placed over and under the mantle, from thick luscious wreaths to rustic burlap ribbons and bows, from cute wood signs to lovely garlands lining the space, this one has got it all! A marvellous decor that comes with a few intended imperfections and distressed paint jobs! It features long candlesticks adorned with round balls of moss, a chic monogram with 3 dimension awesomeness, a thick wreath, while a little rustic wood sign on the other seems to be absolutely unmatchable when it comes to its simplicity. Using light pastel colors incorporating a little pop of blue to the whole setting, along with a massive starburst mirror is the key to this splendid layered spring mantle. A galvanized mug holding flowers, a welcoming wood sign, a printed paper garland, and a bird-inspired painting placed inside a frame are some of the major elements. The union of a shade as bright as yellow with a soothing aqua is quite an uncommon thing to find. However, once you get your hands on this inspiration shared by Yellow Bliss Road, you’ll have so much more faith in the blend. A group of glass jars in lovely aqua and transparent line the mantle, decorated with yellow flowers.